A workshop on Field Level Implementing Strategies of Cultural and Sports Programme was held on July 24, 2017 at PKSF Bhaban. A total of 110 Focal Person and Programme Organisers of 60 Partner Organisations were present in the day-long workshop. Dr. Qazi Kholiquzzaman Ahmad, the honorable Chairman of Palli Karma- Sahayak Foundation, Mr. Md. Abdul Karim, honorable Managing Director of PKSF and Mr. Md. Fazlul Kader, Deputy Managing Director (Programme) were present at the inaugural session of the workshop. The honourable guests discussed the background and perspective of the Cultural and Sports Programme. They welcome the workshop participants and gave necessary guidance to them. 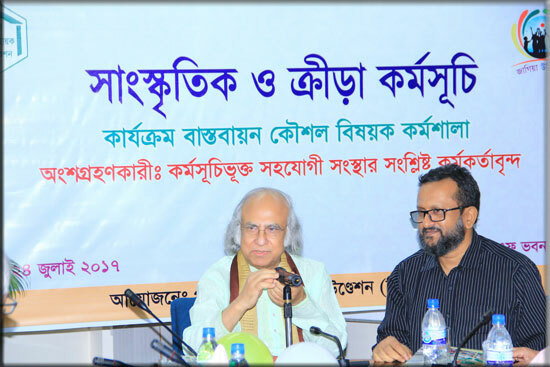 In his speech, Dr. Qazi Kholiquzzaman Ahmad said that culture is a part of development. What we do, what we practices and our movements, all are the part of our culture. “Sports have a joy, it teaches discipline. A child, a teenager who exercisecultural and sports activities will neverinvolve in any illegal activity”, Dr. Ahmad added. Mr. Md. Abdul Karim said that to establish a poverty-free society, our youth need to be healthy and cultured. “Sports and cultural are essential to practice the artistic bent of mind.Mr. Abdul Karim said that implementation of this programme does not require a lot of money, but its impacts are far more and far-reaching. Mr. Md. Fazlul Kader said that sports and cultural practices create a positive attitude towards the people. As a result, people learn to turn around. It’scall sportsman spirit”. We have to awaken the sportsman spirit toour youth. He said the children want heroes. If we fail to present a good hero before them, they will choose a terrified hero. Mr. Abul Hasan Md. Abdul Qaiyum, Deputy General Manager (Programme), PKSF gave a presentation and discussed on strategies for Cultural and Sports Programme at the field level. The respective officials gave chapter wise presentation on the ‘Guideline to Implement the Cultural and Sports Programme’. There was a separate presentation from PKSF Audit Division, where the participants were briefed about budget preparation and re-imbursement. In the workshop, the relevant Focal Person and Programme Organisers of three PO as IDF, ESDO and SKS Foundation shared their field level experiences.